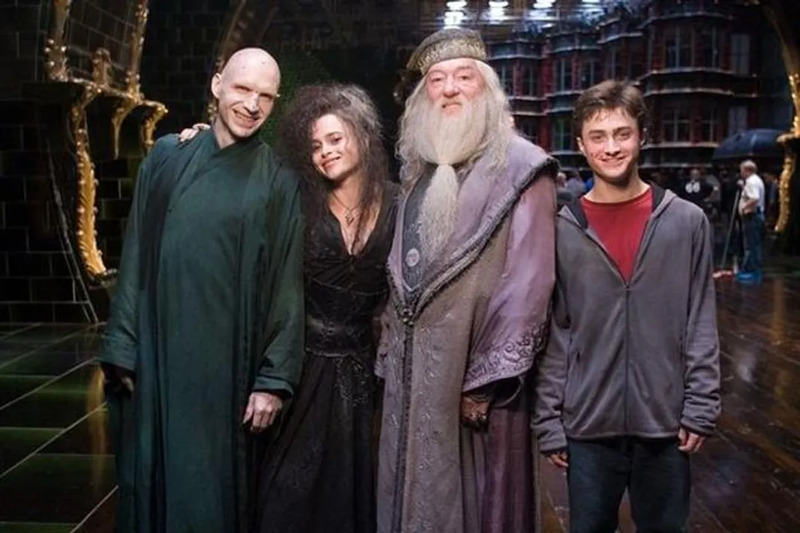 After over a decade of bringing the Harry Potter saga to life onscreen, HP lovers probably started thinking that Daniel Radcliffe, Emma Watson, and Rupert Grint were actually Harry, Hermione, and Ron. 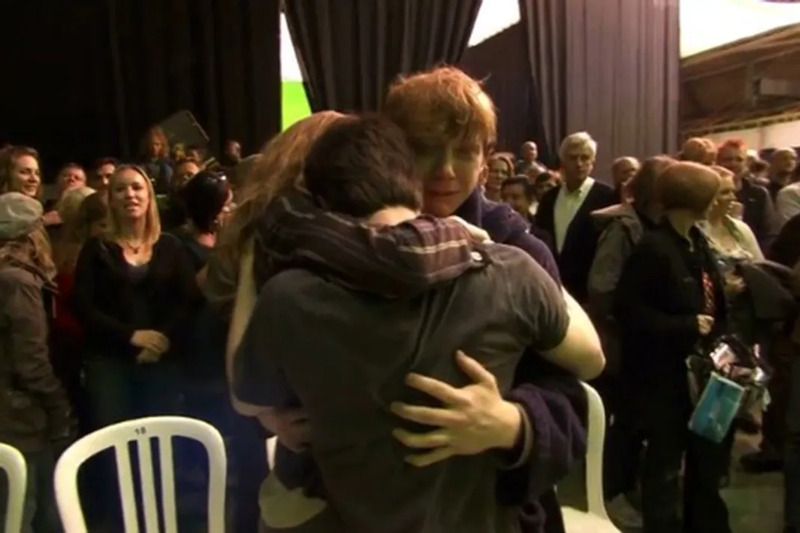 However, these behind the scenes moments prove that these magical actors were simply playing their roles. Here are 25 times the actors from Harry Potter forgot they were supposed to be distinguished witches and wizards. 1. 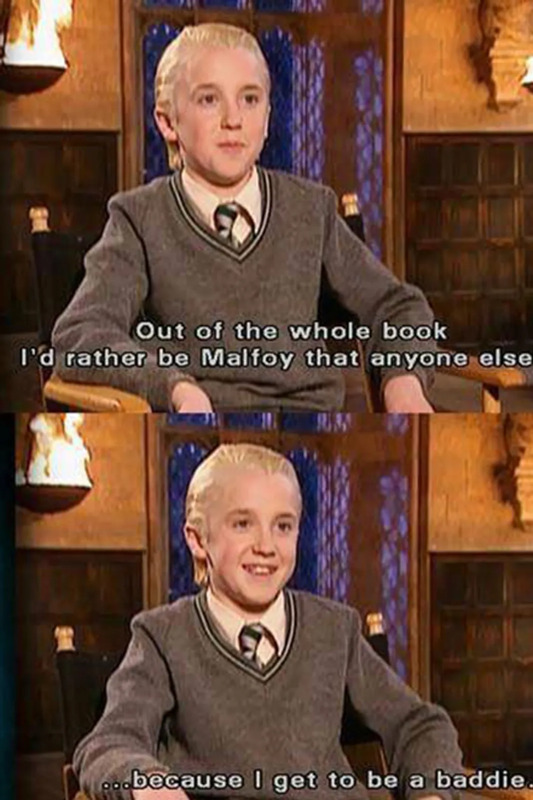 That time Daniel Radcliffe and Tom Felton forgot they weren’t supposed to be BFF’s. 2. When Emma Watson broke a prop and tried to pretend she didn’t. Hermione would actually be horrified. Clearly Dan and Rupert were a terrible influence. 3. When Dan forgot he wasn’t supposed to be a tragic muggle. He was still super cute, even with those ghastly shades. 4. When Alan Rickman slipped up and gave Rupert Grint and Dan Rad all of the house points. It must have slipped his mind that he was supposed to hate their guts. 5. When Helena Bonham Carter forgot that Bellatrix Lestrange wouldn’t dare mock The Dark Lord. We also don’t think tea would be a Death Eater’s drink of choice. 6. That moment when Michael Gambon forgot he was supposed to be collecting Horcuxes, and had a dance party instead. 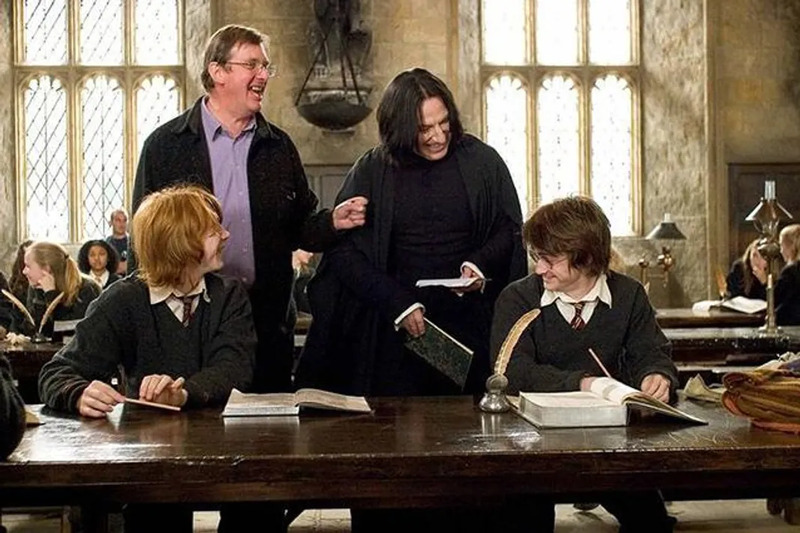 We’ve never seen Snape look so gleeful. 7. When Dan was literally too famished to continue on as The Boy Who Lived. We’d be looking forward to those Welcome Feasts too, Dan! 8. When everyone forgot Dobby’s death was supposed to be gut-wrenching. 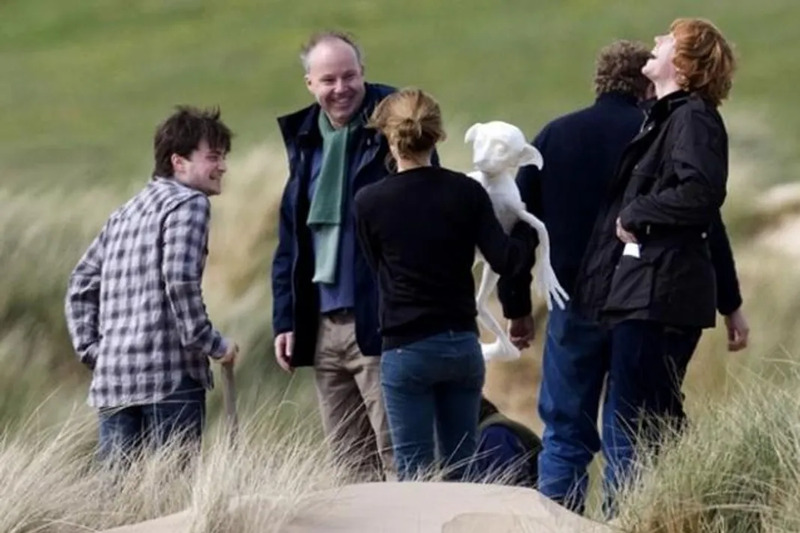 This picture makes us feel as dead inside as that plastic Dobby. 9. When Emma forgot that Hermione didn’t give AF about slapping the crap out of Draco. At least she didn’t mess up Tom’s pretty face. 10. And then Michael Gambon forgot who was actually in Dumbledore’s Army! This photo is beyond disturbing. 11. When Dan forgot that the Harry Potter saga is rated PG-13. This is definitely an image for much more mature audiences. 12. He also forgot that Harry’s wand could do a lot more than stab people. After all of these years of Charms and Transfiguration, this is what he chooses to do! 13. Then he was horrified to realize he’d been destroying wands for years. 80 wands Dan!! Harry wouldn’t have had any gold left in his Gringotts vault! 14. That time Emma and Rupert forgot that their characters we’re supposed to be in love. LOL the lust was clearly NOT real. 15. 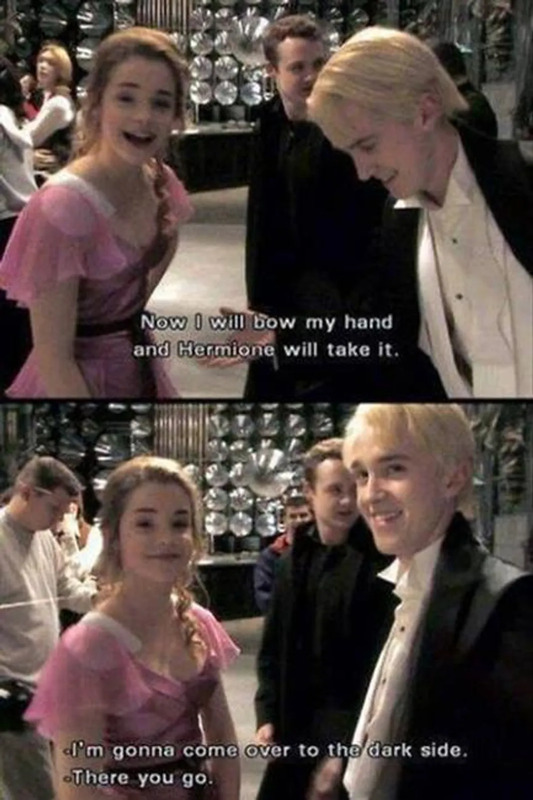 Obviously, Tom and Emma dancing at the Yule Ball should confirmed all of our suspicions. 16. After all, Tom had already revealed he was only pretending to be a #baddie. The Malfoys were low-key iconic. 17. Seriously, Lucius Malfoy was actually an angel in disguise. Clearly Dobby should have been working for Jason Isaacs all along. 18. Bellatrix Lestrange was also obsessed with Dan Rad. We know the feeling Helena, we would pet him all the time too. 19. When Emma forgot that Hermione would literally lay down and die before cheating at anything. 20. When these sworn enemies were suddenly BFFs. Even Dan doesn’t look entirely comfortable with this. 21. The moment Dan Rad realized he was going to be known as Harry Potter for the rest of time. 22. When Dan tried to murder Emma, and Rupert couldn’t be bothered to intervene. He probably was still thinking Ron and Harry were better off as a duo. 23. Or perhaps he was simply exhausted from this scuffle. 24. 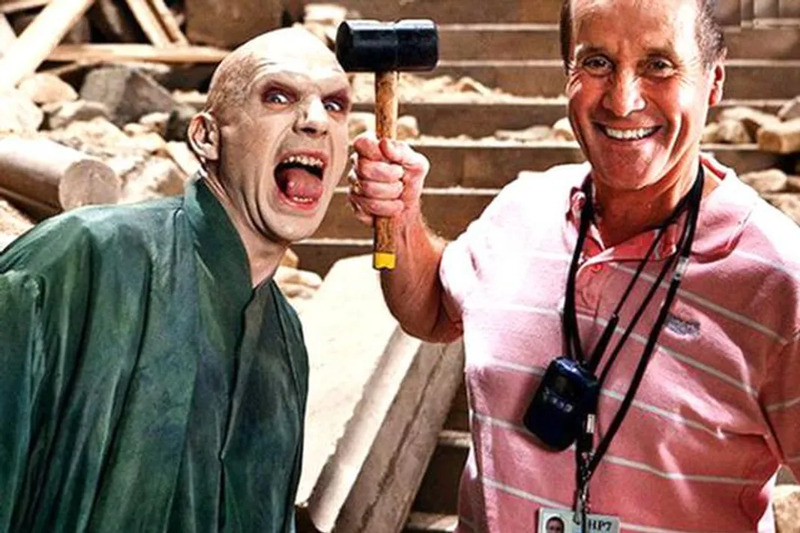 And, that time Ralph Fiennes aka Lord Voldemort allowed a muggle in his presence. The ghost of Tom Riddle is undoubtedly enraged. 25. It was clearly an amazing ten years. BRB, going to bawl now.